The actor Kirinami Senju I held this name from the beginning of the 1690s to 1705. Dates of birth and death unknown. Disciple of Kirinami Senju I, he perfomed under the name of Kirinami Senju II after the death of his master in inaka shibai. He settled in Ôsaka at the beginning of 1718, took the name of Tamishima Senju and performed in ôshibai. He performed in the 11th lunar month of 1718 in Ôsaka at the Kita no Shinchi Shibai in the kaomise drama "In'yô Inui no Machi-zukuri", which was produced by Kokon Shinzaemon. He became wakashugata and took back the name of Kirinami Senju II in the 11th lunar month of 1725, playing in Kyôto the role of Kishinojô in the kaomise drama "Sanpukutsui Eiga no Shikishi". He played in the 11th lunar month of 1726 in Kyôto at Hayagumo Chôdayû's theater the role of Igaya Genzaburô in the kaomise drama "Shinzô Kishi no Himematsu". His rank in the 1727 hyôbanki, wakashugata section, was one stroke below jô (superior) [visual]. No record afterwards. Dates of birth and death unknown. 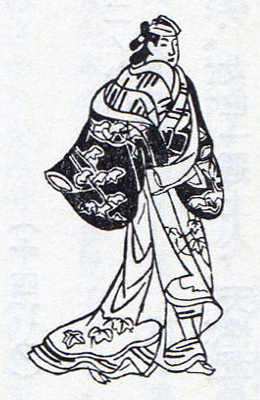 A minor actor was recorded as performing under the name of Kirinami Senju III in Edo at the Nakamuraza from the 11th lunar month of 1758 to the 9th lunar month of 1759. No record afterwards.